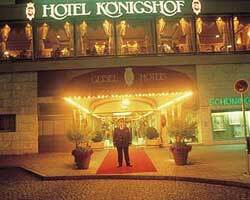 Located on the first upper level of the hotel of the same name, the K�nigshof gourmet restaurant offers a spectacular view of Munich's famous Stachus area. Renowned as one of the best restaurants in the city it serves Modern European dishes like John Dory in a Crust of Bread with Chanterelles and Lovage Stock, Pigeon with fried Goose Liver and Artichokes and Lukewarm Tuna with spiced Tomatoes in a contemporary neo-classic setting. Awarded 18 out of 20 points by Gault Millau, the K�nigshof Restaurant is not only rated for its exceptional cuisine, but also for its exceptionally attentive service. As testament, it has been awarded a Michelin star of the third year in a row and has twice been awarded the honour of Best Hotel Restaurant in Germany.